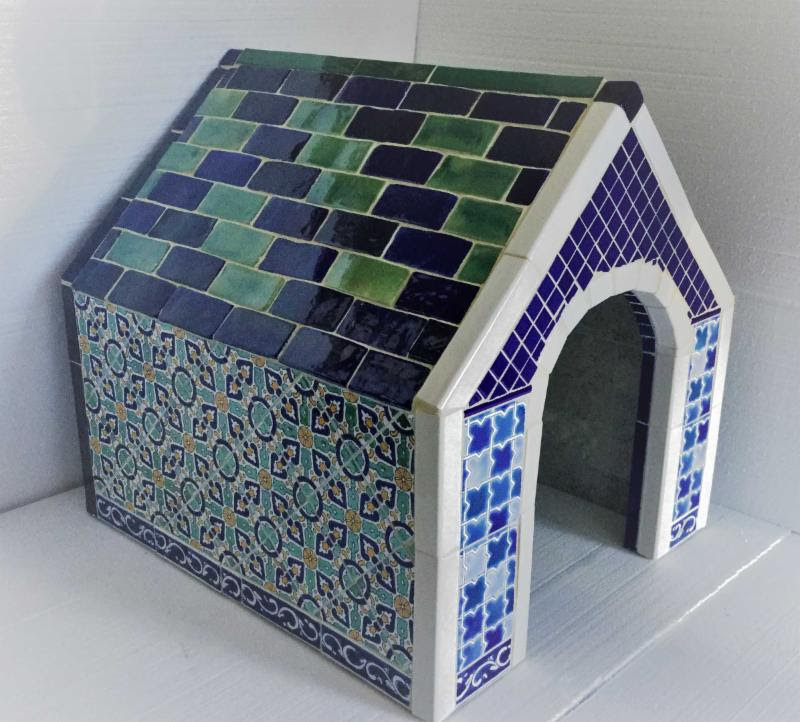 Showing off tile’s versatility and style, 20 members of Tile Council of North America, Inc. (TCNA) generously donated unique, handcrafted tiled doghouses to the Pet Alliance of Greater Orlando at Coverings 2019 in Orlando, FL. The participating companies included: AlysEdwards Tile & Stone, American Glass Mosaics, American Wonder Porcelain, Anthology, ARTO Brick & Tile, Casa Ceramica, Crossville, Del Conca USA, Florida Tile, International Wholesale Tile, Julian Glass, Lilywork Artisan Tile, Lunada Bay Tile, M2 Innovative Concepts, Marazzi, Marble Systems, Portobello America, Syzygy Tile, Tile By Design, and Vitromex. The forms used to make these doghouses were custom manufactured by Wedi Corp. and contributed by Wedi and TCNA. During the show these one-of-a-kind, handmade creations were on display in the TCNA Art Tile Courtyard and TCNA’s booth, where attendees could see the craftsmanship firsthand and meet furry friends from the Pet Alliance of Greater Orlando. A donation ceremony was held in the TCNA Art Tile Courtyard at 3:15 p.m. on Thursday, April 11th. The following descriptions were provided by the companies/artists who tiled the doghouses. Mon Ami Paris! From bistros and cafes to museums and gardens, stroll with us as we explore the best Paris has to offer. With our tres chic doghouse, we’ve tried to capture all the favorite spots, both new and old, to sit, sip, relax and enjoy Parisian life. Windows framed with CarBONE liners create Louvre-ly Reflections for any pup peaking in. Don’t worry if you have a Pebble Without a Cause; our house comes complete with Lime-olicious gl-rrrass! A romantic energy mixed with an urban-chic aesthetic can invigorate even the weary while they enjoy the local culture, sights and sounds. Eiffel For You, and AlysEdwards has left her signature stamp of approval because every pup deserves a kiss! 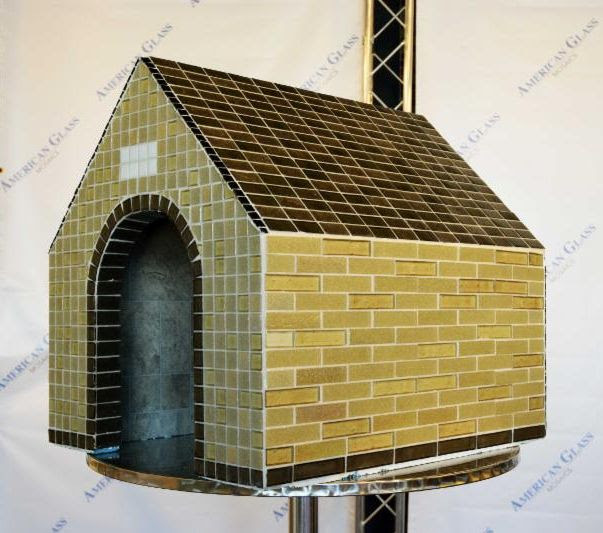 The theme of American Glass Mosaics’ doghouse is Northern Blends, as their tiles are manufactured “up North” in Michigan; the roof tile is from their Superior Collection “Northern Blend;” and they wanted to honor the president/CEO’s dog, which is a Lab and Poodle blend. The designer/installer was Carlo Pozzobon. It’s a dream dog cabin! American Wonder Porcelain’s doghouse features the beautiful, rustic, wood-look tile series Luna Orchard PorcelainTM. Cut pieces of 6″ x 36″ are featured in Mist LN02 on the front and sides and Shadow LN05 on the roof. 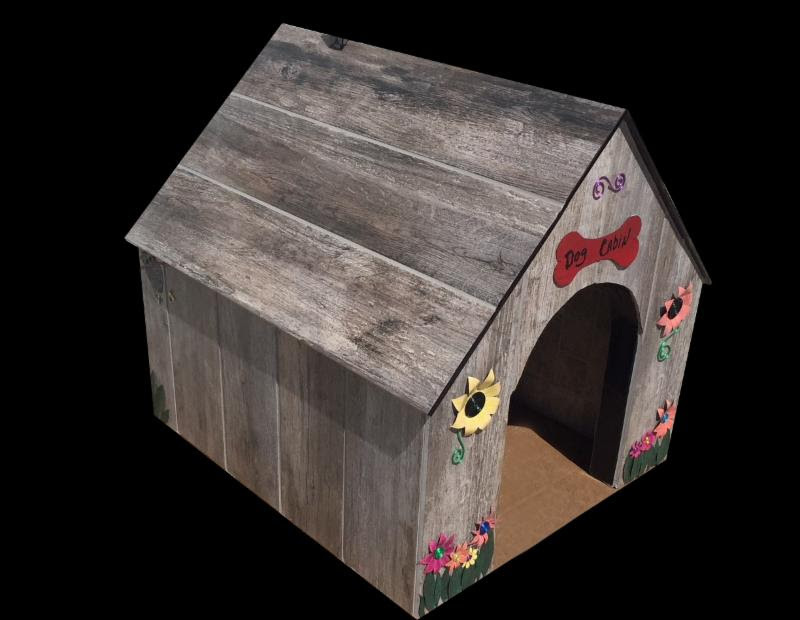 This cozy dog cabin, with decorative touches like flowers adorning its entrance, is ready for an eager pup! 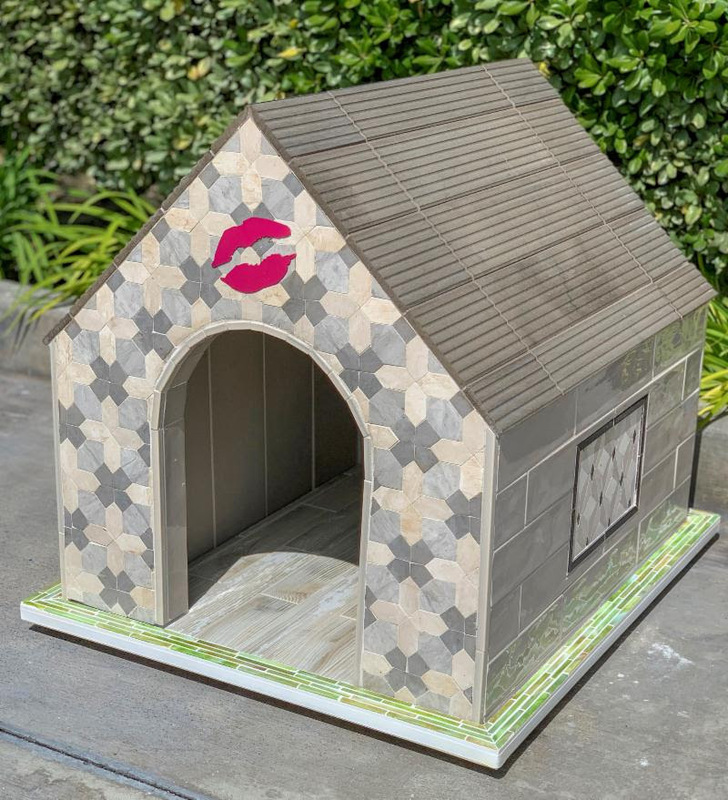 Anthology tile wanted to create a very special doghouse, so they used their Euphoria collection, which has a beautiful reflective glass, and Monet magic glass roof tiles, which complete this masterpiece. The true-blue color is associated with dogs and loyalty. Molded glass raindrops fall on the roof, as this house will shelter precious puppies from the rain. The doghouse was designed by Suzi Portugal, an absolute dog lover herself, and happily completed and executed by Anthology’s team. 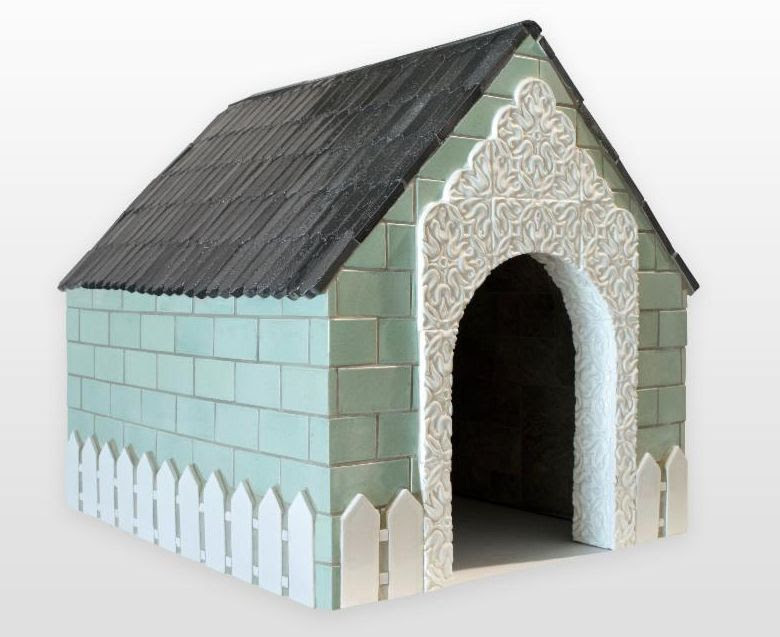 This doghouse is a gift from Anthology tile given with their love of tile and dogs. 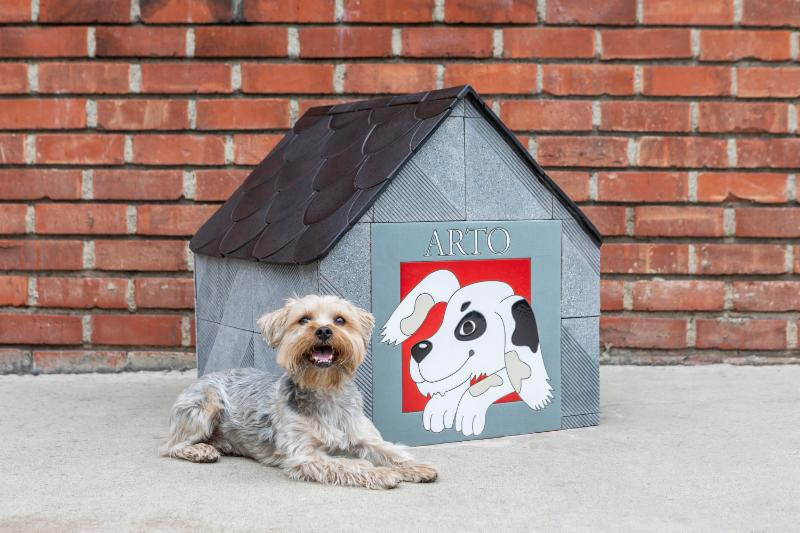 ARTO, known for handcrafted tiles made in California, has created this rustically elegant doghouse. The outside walls are cladded with grooved concrete terrazzo tiles, which surround the custom, hand-painted “Happy Dog” tile on the back wall. The roof is tiled with 8″ black diamond ceramic fish scale tiles. The back inside wall displays ARTO’s ornate 8″ hand-painted Kaleidoscope tiles, and the floor is covered with 4″ timeworn Sirocco black ceramic tiles. 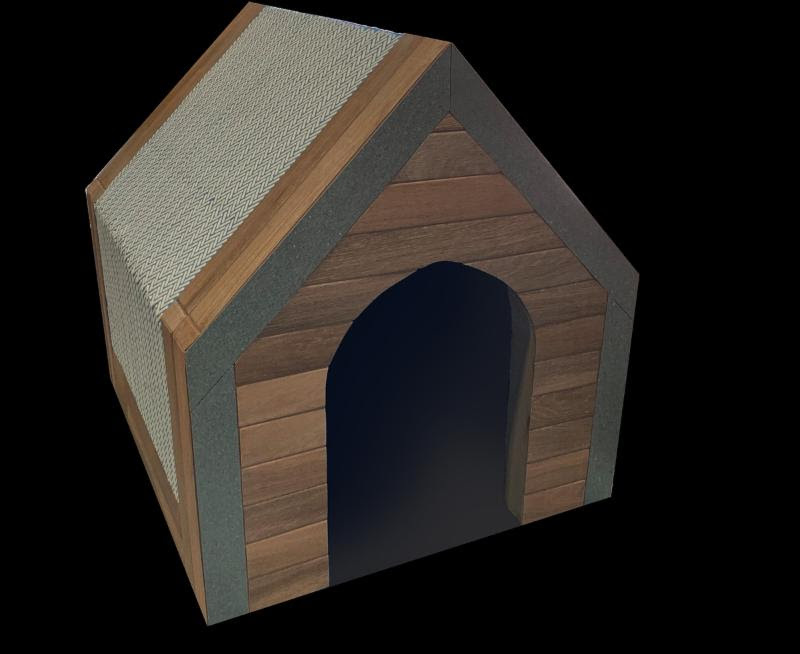 This doghouse was made completely by hand and with love by the people at ARTO. Casa Ceramica’s doghouse was designed and installed by its in-house design and installation team. 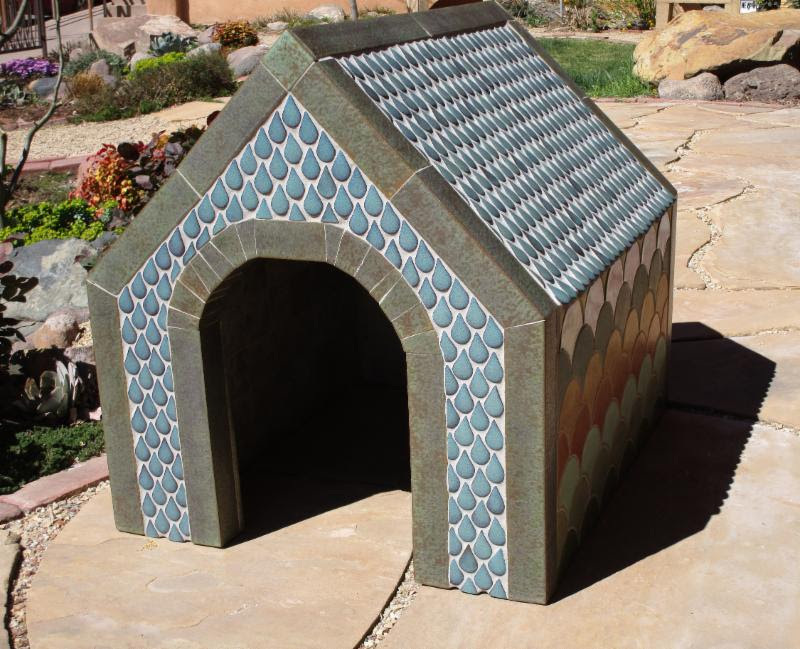 Their Spanish-inspired doghouse design features tiles and trim pieces from their Mediterranean and Palacio tile collections. The bones were made locally in Florida by the same artist who produces Casa Ceramica’s custom tiles. Crossville’s tiled doghouse features some leading trends in tile design. The walls are made with Crossville’s yet-to-be-released Alaska collection. The terrazzo-look tiles have mitered edges and create the appearance of a continuous piece of terrazzo. 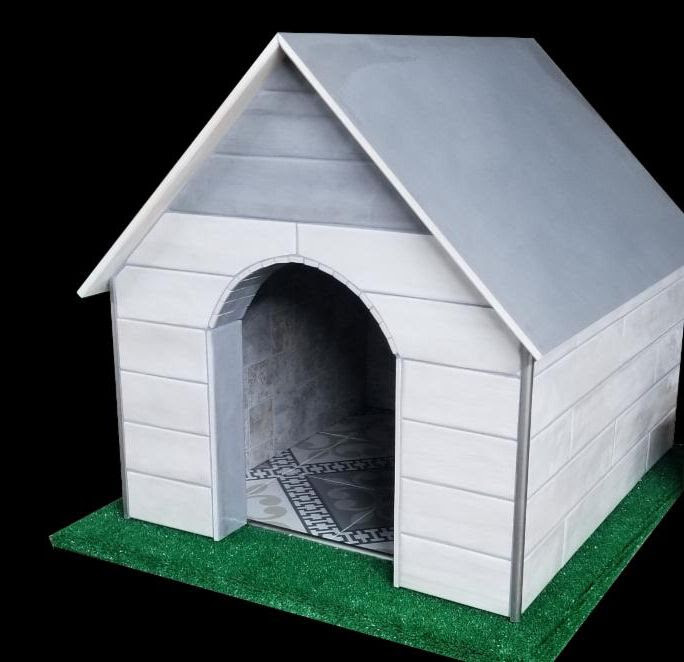 Waterjet-cut dog figures, inspired by the works of MC Escher, are crafted in the Basalt collection and placed as accents on the doghouse’s sides. The rooftop is made of the popular Sideview glass mosaics in a matte silver finish, adding dimension and a touch of glam. Crossville’s Tradeshow Manager, Earl Randolph, developed the design for this project. 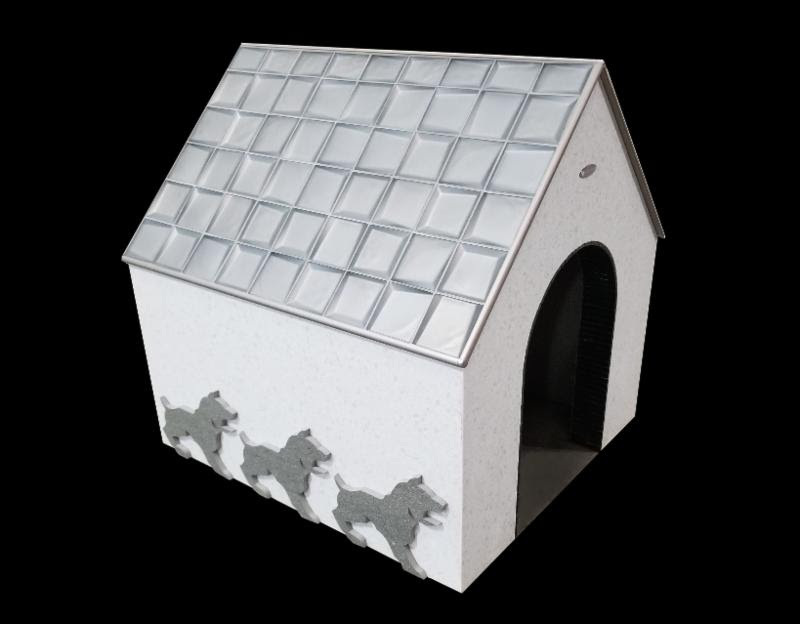 Del Conca USA’s doghouse showcases 32″ x 71″ Pandora Gray (roof), 3″ x 16″ Gray and White Kensington (exterior), and 8″ x 8″ Havana Gables on the interior. The doghouse was designed and installed by Brad Crowder of Crowder Tile. 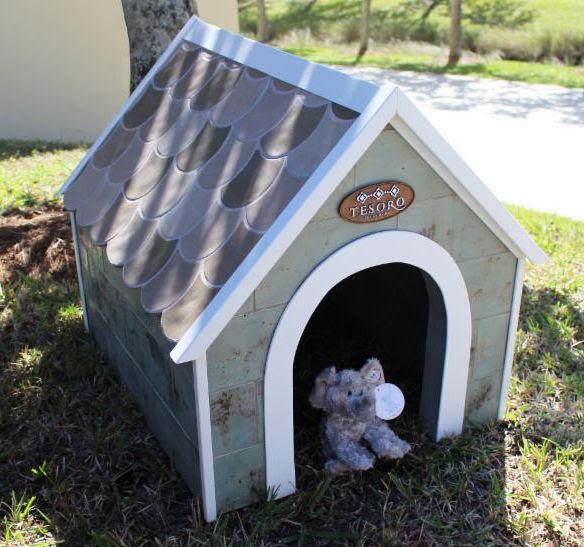 Florida Tile created a puppy home that will be a place of possibility and comfort for its future “fur baby” resident. The exterior walls are tiled with LocalHDP that features a look of weathered, painted wood. It beautifully accomplishes the goal of giving this special space a feel of warmth and belonging. The home’s roof is completed with AventisHDP THINNER, a 3.5 mm tile that is elegant and light, yet durable. International Wholesale Tile’s doghouse showcases Inspire by Tesoro and newly launched collections, Scales and Urbano, along with Tesoro’s new company mascot, Argento! Julian Glass’ doghouse features multicolored, multi-textured large glass tiles with an ocean coral theme. Here’s a ready-made, beachy pad for the water-loving pooch. 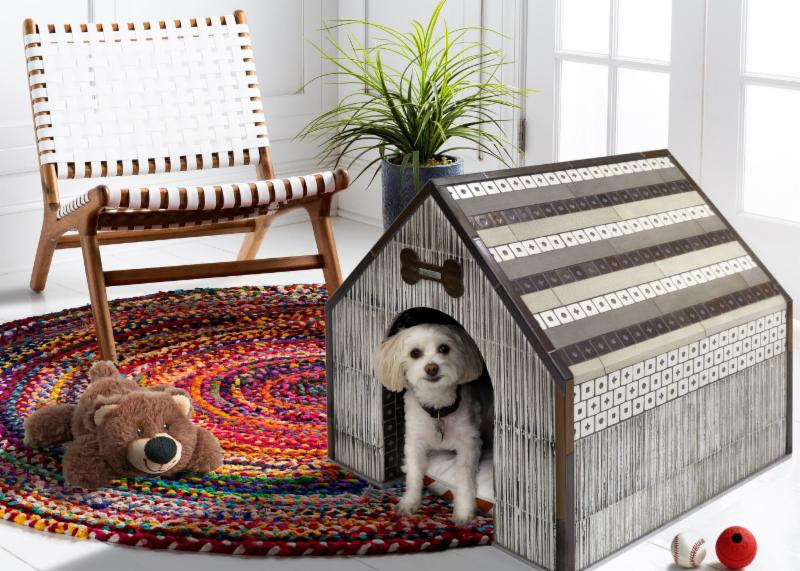 This doghouse has a Zen-bohemian feel that takes us on an epic wave of design. The house entrance and sides features Tide Dye, a new design in the soon-to-be-launched concrete series for Tommy Bahama by Lunada Bay Tile. Accenting the roof is a sneak peek of Silhouette, an exciting addition to their ocean-inspired Shinju ceramic collection. Alternating rows of linen-textured concrete liners add to the roof’s varying colors and textures, making this the place all the friends and family want to come to play. Cowabunga! 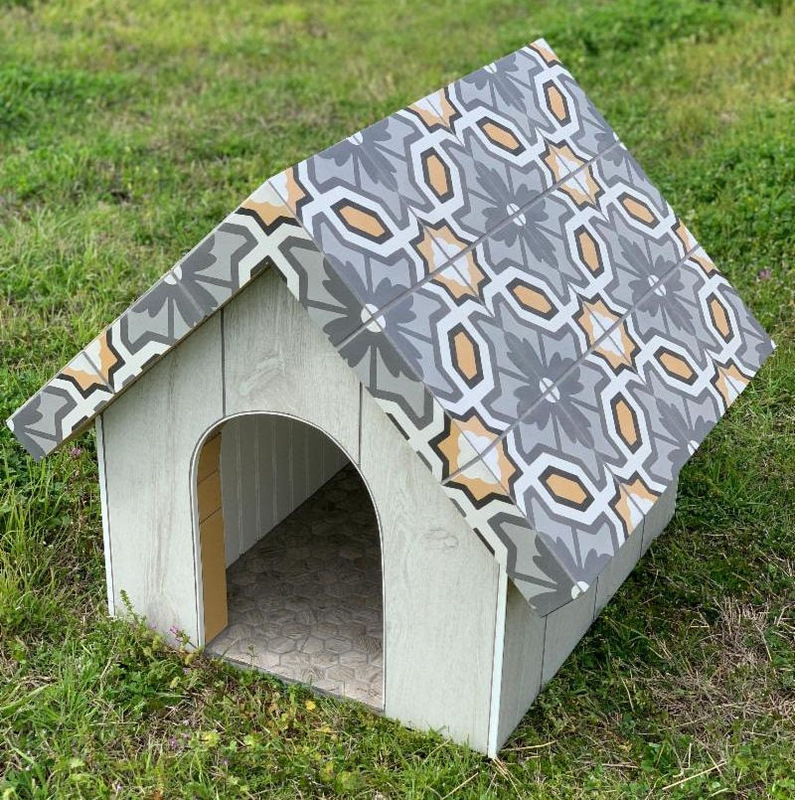 M2 Innovative Concepts’ doghouse features a camouflage effect, and the tessellated dog pattern is water jet-cut. The self-cleaning surfaces are comprised of products that use Hydrophilic Tile technology. The porcelain tiles have titanium dioxide fired insolubly and permanently into their surface. This triggers a reaction activated by light, oxygen, and humidity and sheets dirt off the surface, kills germs and bacteria on contact, and eliminates odors! 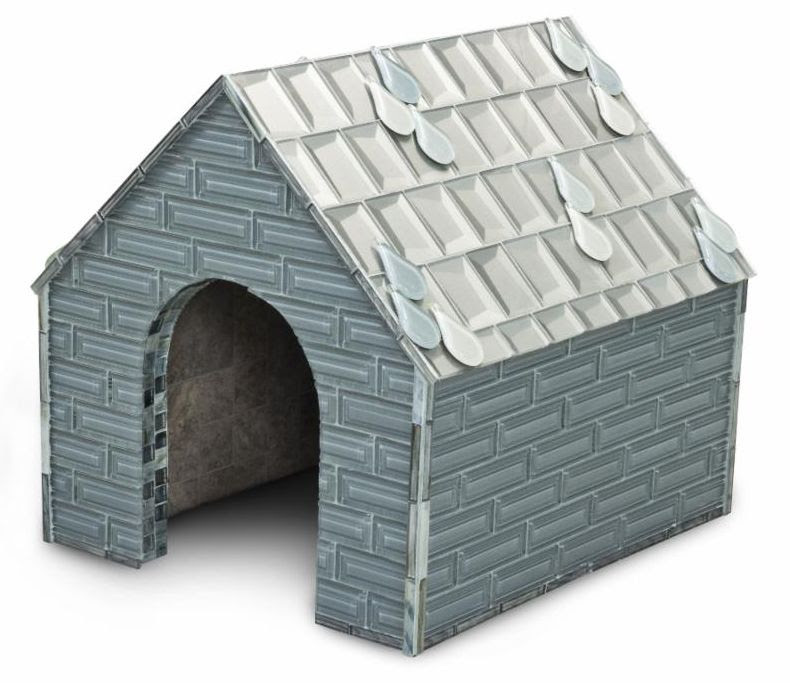 The Marazzi and American Olean brands teamed up to produce a custom tiled doghouse that showcases the distinct personality of each brand and provides some lucky dog with a house that is the epitome of on-trend style and fun. The result is a wonderfully eclectic house for Fido that artistically combines Marazzi’s bold, Italian styling with the clean lines and soft colors of American Olean. The roof is covered in Marazzi’s new encaustic-look tile (Marazzi’s D_Segni Color Collection – Honeycomb), creating a stylish focal point that is both fun and chic. The bold, over-the-top encaustic design was complemented with a soft, weathered white wood visual on the rest of the house. Covering the four walls of the doghouse is American Olean’s Waterwood Collection – White Oak. Inspired by the bricola wood pillars that grace the waterways of Venice, this unique wood-look tile provides the visual softness of authentic waterworn oak wood. To top it all off with a nice, trendy touch, 1-½” hexagon mosaics from the Waterwood Collection were placed on the floor of this little pooch palace. The doghouse designer was Sarah Morales of Marazzi and American Olean, and the installer was Albert Pena of Mecca Design. Princess and Max, the official Country Floors pets, wanted a play/guesthouse for their friends’ young litters. Sitting in their backyard overlooking Coopers Beach in their Hamptons summer house, the brother and sister design duo wanted a smaller version of their 1920’s colonial style cottage. Max, a devoted fan of the famous wire dancer “Princess Victoria,’ commissioned local artist and muralist Jean Laloi to paint a mural replicating a circus poster of the late wire dancer icon on the back wall of their small guest house! The doghouse was designed by Omar Torres, Country Floors’ product and facility designer, and installed by their in-house board production department. 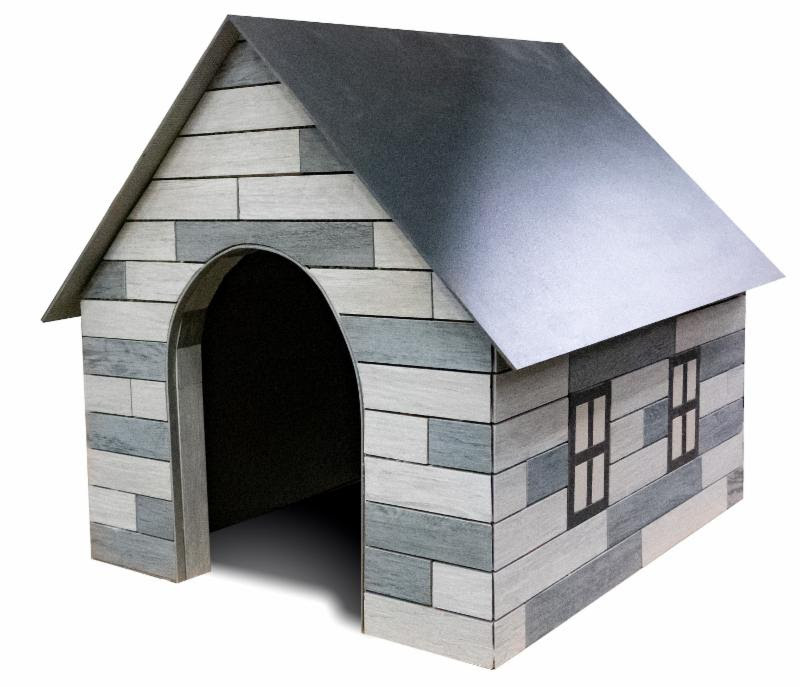 Portobello America’s doghouse features a contemporary look, using three product lines: Forest (wood look), NYC (mosaic), and Barcelona (concrete look). The idea came from architect Andreza Zago. 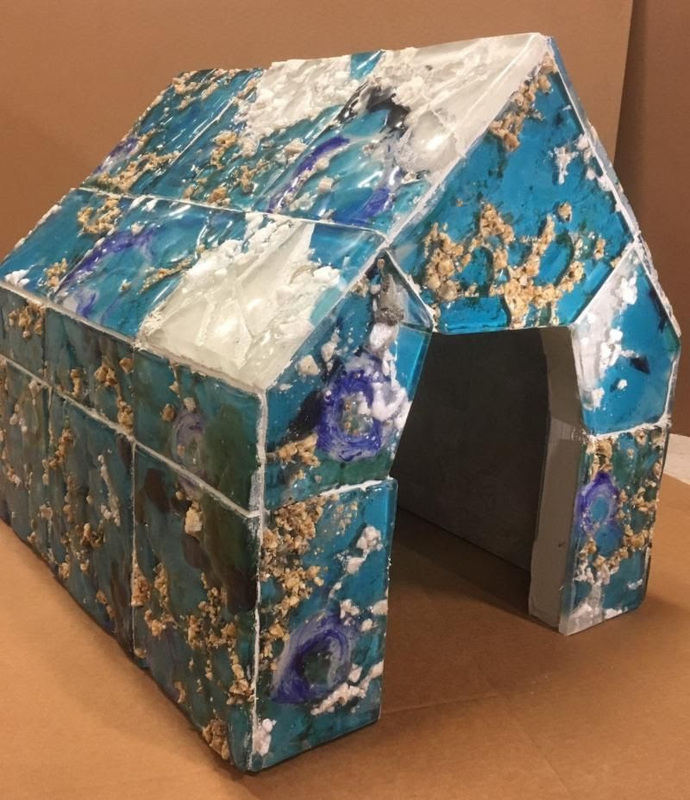 Syzygy Tile’s Cool Blue doghouse was designed by Lori Reyes, mosaic department leader. 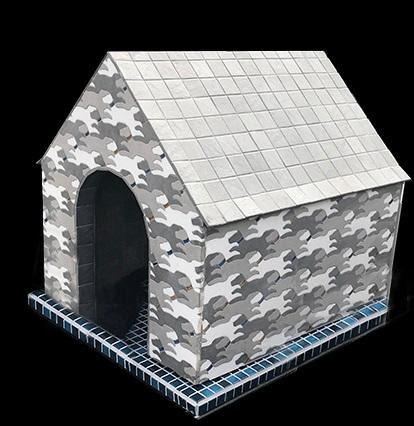 The doghouse showcases Syzygy’s new Rain Drop mosaic in Midnight glaze, as well as their 4″ Koi mosaic in a colorful fade. Tile By Design specializes in hand-painted and digitally-decorated artisan tile. Their digital division has the ability to print any image, artwork, or design on tile. They only hope the house’s future inhabitant doesn’t have any trouble with the PUParazzi! Pet Alliance of Greater Orlando was founded in 1937 as the Orlando Humane Society. Since then the organization has worked hard to provide positive and safe outcomes for pets. Today the Pet Alliance has a dedicated focus on the welfare and well-being of dogs and cats in Orange, Seminole and Osceola Counties. As the “go to” experts in Greater Orlando, they do good things for dogs and cats and the people who love them. Their goal is to provide compassionate and knowledgeable services for pets and to be leaders in innovative animal care and veterinary medicine. For more information about the Pet Alliance of Greater Orlando, please visit https://petallianceorlando.org. tagged with #Coverings2019, #doghousehunters, #dogsofcoverings, #fixerpupper, #TileGeeks, AlysEdwards Tile & Stone, American Glass Mosaics, American Wonder Porcelain, Anthology, ARTO Brick & Tile, Casa Ceramica, Crossville, Del Conca USA, dog houses, Florida Tile, International Wholesale Tile, Julian Glass, Lilywork Artisan Tile, Lunada Bay Tile, M2 Innovative Concepts, Marazzi, Marble Systems, Portobello America, Syzygy Tile, tile art, Tile By Design, Tile Council of North America (TCNA), tile design, Vitromex, Wedi Corp.